The Rebel Sweetheart. 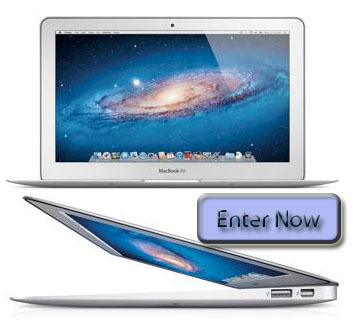 : Join | MacBook Giveaway! Thinking of getting a new gadget? Or in need of some cold, hard cash? Joys Of Life, Empowered Mommy and Pregnancy Forum have teamed up The Rebel Sweetheart plus many of the awesome bloggers to bring you a tremendous giveaway! Do you own a Macbook? Maybe this could be your first ever Macbook you owned or were you looking to replace your old Macbook/Laptop? Here's your chance to win an 11-inch MacBook Air. Winner has choice to either choose a Macbook or $500 Cash. The winner will be notified via email. No reply within 48 hours would make us choose another winner at random. For fairness sake, we will be evaluating all the entries - anyone that uses multiple entries from one ip address will be disqualified from the giveaway, any suspicious entries will be disqualified. Only ONE ip per household is allowed. Those who opted out of the opportunity are not allowed to enter the giveaway. Please read our disclosure for more information and giveaway rules. Thank you to all the bloggers and wonderful people who have donated enough to make this giveaway a big and successful event. Rest of the prize amount has been covered by Joys Of Life, Empowered Mommy and Pregnancy Forum. Allow the rafflecopter widget below to load. Make sure you complete all the tasks to maximize your chances to win. This giveaway is open WORLDWIDE and runs from September 17 to October 17. DISCLOSURE: I was not compensated for this publication. All views, opinions and impressions are my own and may differ from that of yours. The Rebel Sweetheart is not responsible for the prize shipment. I have always wanted to try an Apple computer. Thanks for the giveaway! I want to win because I hate the restrictions of having to be at the desk top all the time. I need a laptop for school. Thanks!